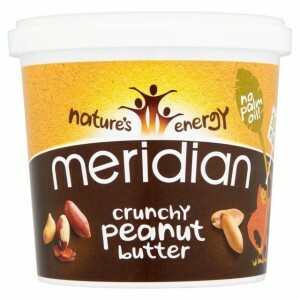 All Meridian nut butters are natural, and do not include palm oil, sugar or any other additives. They are made using 100% peanuts or nuts, lightly roasted, and then ground into a delicious nut butter, so you can enjoy all the nutritional benefits and flavour of nuts, with nothing else added, and nothing taken away! The range includes classic Peanut, Cashew and Almond butters, all available in Smooth and Crunchy varieties, depending on your preference, and Hazelnut butter, which is available in Crunchy (the way it’s enjoyed best). Peanuts (technically not a nut, but a legume) and nuts are nutritionally superior; they are an excellent source of protein, healthy mono and polyunsaturated fats and dietary fibre. They also deliver valuable minerals such as calcium, magnesium, potassium, phosphorus and iron; vitamin E, B vitamins and phytochemicals (variance depending on the nut, respectively). 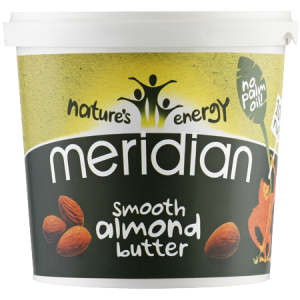 Meridian Smooth Almond Butter 1000g is made using 100% almonds. 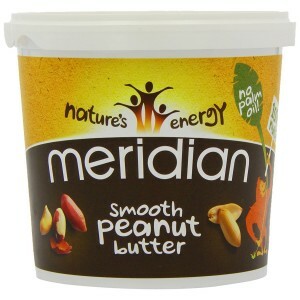 Each almond contains around 20% prot..
Meridian Smooth Peanut Butter is rich in energy, packed full of protein, and made with 100% nuts. 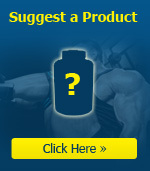 Pe..